« What a gorgeous and inspiring find! Messy. I know. This went through lots of revisions, many not erased very well. At this stage, I’m just trying to settle on an overall composition that I can then play with further on the design wall. 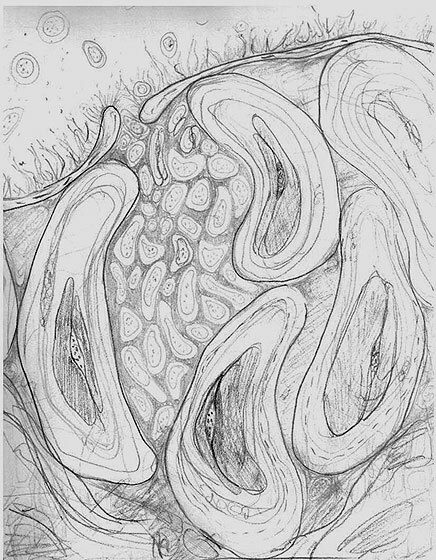 The large cellular shapes needed to fit together in a flowing way that also created lovely negative space between them. I also wasn’t sure at this point whether I wanted those large shapes to be solid OR to have a solid core/nucleus with translucent space around that defined by lines. This entry was posted on May 2, 2010 at 1:25 pm and is filed under Process, Uncategorized. You can follow any responses to this entry through the RSS 2.0 feed. You can leave a response, or trackback from your own site.